Once the apostille has been issued we can translate the certificate into more than 100 different languages. To get your apostille or any other document translated please get in touch with us. Legalised documents that have been issued with the apostille may also need translating. Our team of translators can translate your document in approximately 24 hours. With over 100 languages covered we can quickly produce your document in a foreign language. The apostille certificate may also need to be translated. It is common for foreign organisations to request a translation of the apostille certificate. The UK apostille has most of the text written in English. Several phrases are also produce in French and Spanish but most of the text in English. If you need your apostille or any other document translated do not hesitate to contact us for a quote. 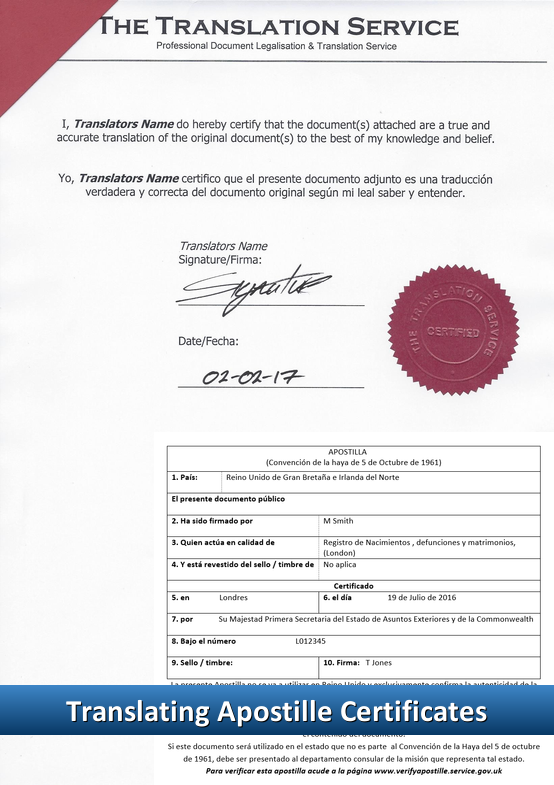 You can see a sample of our translation certification with an apostille that has been translated into Spanish on this page. You will note that when possible we maintain formatting and structure of the document.